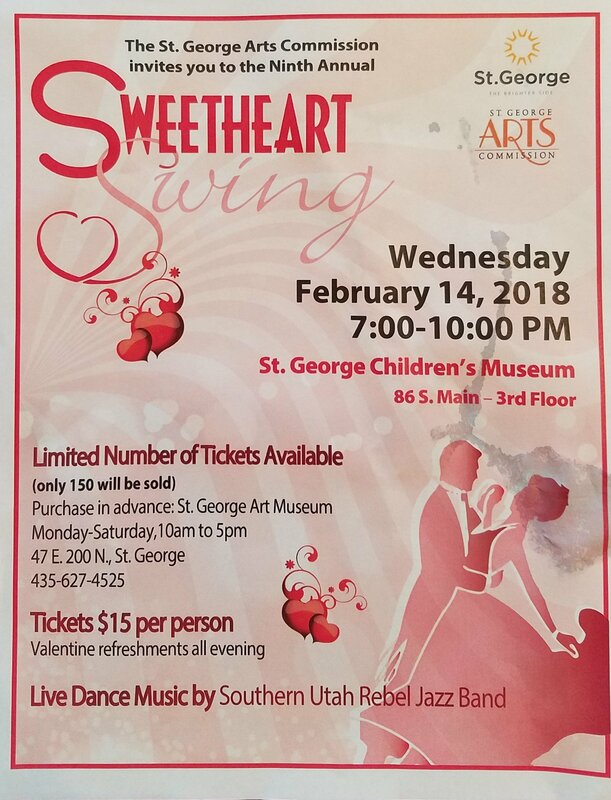 ST. GEORGE — The Sweetheart Swing on the third floor of the St. George Children’s Museum on Main Street is a great place to spend Valentine’s Day with your sweetheart, dancing to the music of yesterday. The dance floor is certain to rock with rhythm in a spirit of love and romance with a live band, a grand floor show and sweethearts swinging to big band sounds. “We always look forward to a superb, impressive evening, and I especially enjoy seeing all the dancers on the dance floor—and the music is amazing,” Angie Mason, community arts events coordinator said. The music to which Mason refers will be provided by the Rebel Jazz Band with a dazzling display of talented instrumentalists led by local musician Glenn Webb. “The big band sound is an American original and perfect for this occasion,” Webb said. The Rebel Jazz Band exists to preserve and promote the classic sounds of 20th century jazz and swing, he said, and to adapt those sounds to today’s trends. Another highlight of the evening will be the dance entertainment presented by dancing troupe Red Rock Swing Dance. The St. George Arts Commission, under the auspices of the city of St. George, has orchestrated a tradition in the annual Sweetheart Swing, now in its ninth year. Tickets are $15 per person and include Valentine refreshments with dancing from 7-10 p.m. Only 150 tickets are available. Tickets can be purchased the night of the event at the door of the Children’s Museum, 86 S. Main St., or in advance at the St. George Art Museum, 47 E. 200 North, Monday-Thursday 10 a.m.-5 p.m. When: Feb. 14, 2018 from 7-10 p.m.
Where: St. George Children’s Museum, 86 S. Main Street, St. George. Third floor. Admission: $15 per person (only 150 tickets available). Tickets may be purchased at the door night of the event or in advance at the St. George Art Museum. Call telephone 435-627-4525 to find out ticket availability.